Although only about a quarter of the countries included in the study fall into the most religiously restrictive categories, some of the most restrictive countries (such as Indonesia and Pakistan) are very populous. As a result, roughly three-quarters of the world’s 7.2 billion people (74%) were living in countries with high or very high restrictions or hostilities in 2014, down slightly from 77% in 2013. The increase in the number of countries with religion-related terrorist activity – which is counted as a social hostility in this study – was offset by decreases in the number of countries that experienced other types of social hostilities involving religion.4 For example, there was a decline in the number of countries in which individuals were assaulted or displaced from their homes in retaliation for religious activities considered offensive or threatening to the majority faith in their country, state or province. There also was a decline in the number of countries where threats of violence were used to enforce religious norms and a global decline in the incidence of mob violence related to religion. Several factors contributed to the overall decline in government restrictions on religion. For instance, there was a decrease in the number of countries where some level of the government – national, provincial or local – interfered with worship practices. There also was a sizable drop in the number of countries where governments used force against religious groups that resulted in individuals being killed, physically abused, imprisoned, detained or displaced from their homes. Looking at the overall level of restrictions in 2014 – whether resulting from government policies and actions or from hostile acts by private individuals, organizations or social groups – the new study finds that restrictions were high or very high in 34% of countries, down from 39% in 2013 and 43% in 2012. This is the seventh in a series of reports by the Center analyzing the extent to which governments and societies around the world impinge on religious beliefs and practices. The studies are part of the Pew-Templeton Global Religious Futures project, which analyzes religious change and its impact on societies around the world. The project is jointly funded by The Pew Charitable Trusts and the John Templeton Foundation. To measure global restrictions on religion in 2014, the study ranks 198 countries and territories by their levels of government restrictions on religion and social hostilities involving religion. The new study is based on the same 10-point indexes used in the previous studies. The new study looks at the prevalence of restrictions and hostilities by region and by country. The Middle East and North Africa region continued to have the highest median level of government restrictions on religion, although the region’s score on the GRI dropped slightly from 2013 to 2014. 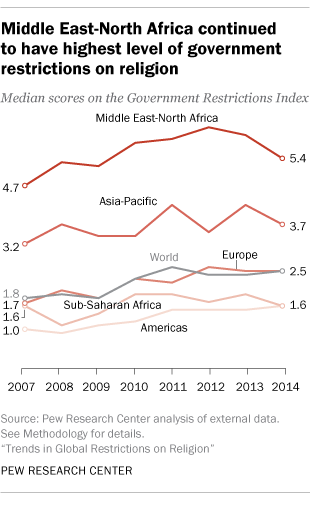 Median scores on the Government Restrictions Index also decreased modestly in Asia and the Pacific and in sub-Saharan Africa; scores stayed about the same in the Americas and Europe. 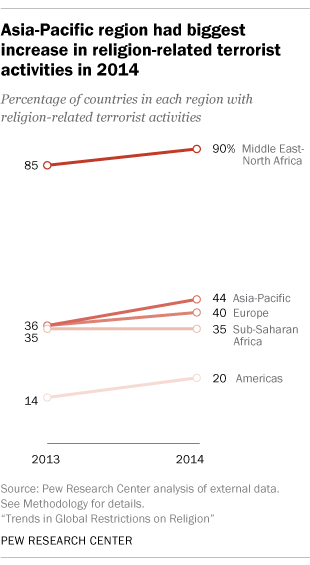 In 2014, religion-related terrorism went up in all regions except sub-Saharan Africa, where the number and share of countries with this type of religious hostility stayed the same in 2013 and 2014 (17 of 48 countries, or 35%, in both years). The biggest increase was in Asia and the Pacific, where the number of countries with religion-related terrorist activities went from 18 in 2013 (36% of the region’s 50 countries) to 22 (44%) in 2014. The Middle East-North Africa region continued to have the highest share of countries with religion-related terrorism; such hostilities occurred in 18 of the region’s 20 countries in 2014 (90%), up from 17 in 2013 (85%). In Europe, 18 of the 45 countries (40%) had religion-related terrorism in 2014, up from 16 (36%) in 2013. Seven of the 35 countries in the Americas had this type of religious hostility (20%), up from five countries in 2013 (14%). 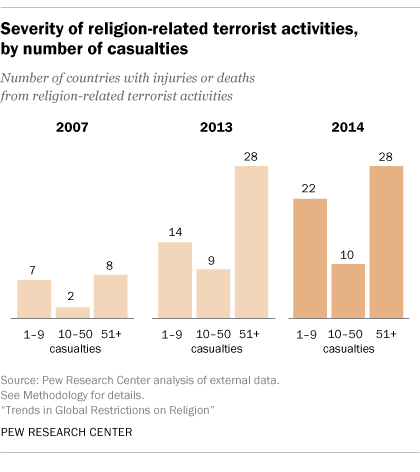 Looking at the severity of religion-related terrorism (as measured by the number of injuries or deaths), the biggest increase from 2013 to 2014 was in the category with one-to-nine casualties; the number of countries in this category rose from 14 in 2013 to 22 in 2014. By contrast, there was only one more country in the second-highest category (10 to 50 casualties) in 2014 than in 2013. And the number of countries with more than 50 injuries or deaths stayed the same (28 in each year). While the number of countries with more than 50 casualties remained the same from 2013 to 2014, it has risen dramatically in recent years. 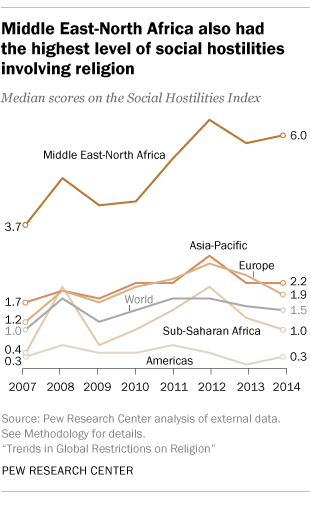 In 2007, the first year for which Pew Research Center has data, only eight countries had this level of casualties. In 2014, 28 did. Readers should note that some of the increase in casualties from religion-related terrorism, especially from 2007 to 2009, could reflect the use of new sources that provide greater detail on terrorist activities than the sources used in the early years of the study. (See Methodology for more details.) Nevertheless, the number of countries experiencing more than 50 casualties as a result of religion-related terrorism was significantly higher in 2014 than it was in earlier years.